PEAS has been building and running private, or non-state, secondary schools for almost ten years. We currently operate 30 schools across Uganda and Zambia, educating over 15,000 studennts. We know from external research that PEAS schools serve significantly more disadvantaged students than do government or other private schools, and help these students to make faster learning progress. PEAS schools also operate at a lower cost per student, suggesting that our model, as well as being more inclusive, is also more cost-effective and sustainable. PEAS’ experience demonstrates that non-state operators can help governments improve inclusion and offer a sustainable solution to filling the education gap. However, our experience also demonstrates that the operating models of non-state providers matter. Place schools where need is greatest. PEAS conducts land research and works with local governments to decide where to place new schools, focusing on areas of low provision and high demand. PEAS’ policy provides many marginalised communities access to secondary education for the first time. This is reflected in the fact that most PEAS students are the first generation in their families to attend secondary school. Operate non-selective admissions policies, and reserve places for underrepresented groups. PEAS schools are open to all students, irrespective of background or ability. We have a non-selective admissions policy and reserve 50% of school places for girls. As a result, PEAS students have statistically worse prior attainment than students in government schools, and over 50% of students enrolled in our networks are girls. Ensure school fees don’t crowd out poorer students. 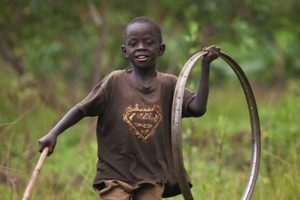 PEAS schools admit twice as many of the poorest students in Uganda as do government schools, and three times as many as do other private schools. While PEAS schools currently need to charge fees to cover their running costs, our schools are still more equitable than other school types. To ensure schools don’t crowd out poorer families, fees are set locally based on affordability benchmarking, and boarding fees are used to cross-subsidise day fees. Provide targeted support for disadvantaged groups. We recognise that not all students start secondary school on an equal footing. To recompense discrimination and disadvantage, PEAS provides targeted support to girls to help them participate successfully in learning. We currently are developing a special educational needs strategy to strengthen the support students receive in our schools. The core of our sustainability model is that our schools should be able to cover their own running costs through renewable income sources. This requires a dual focus – on keeping costs as low as possible, and on ensuring that sufficient income is generated by the network. Develop a clear method for understanding operator costs to test for efficiency. External research has found PEAS schools in Uganda spend 15% less than government schools per student and 6% less than private schools in delivering education. When the stronger academic progress of PEAS students is taken into account, this arguably makes PEAS more cost-effective in delivering quality education. PEAS has opened its school accounts up to external researchers and continually sought information on the operating costs of comparative models. This provides confidence that what we are delivering could be replicated at scale by government or other providers. Acknowledge the trade-offs between access, quality, and sustainability by considering the ongoing staffing and financial costs of interventions. Innovative ideas for how to rapidly improve education quality often come with a cost. In reality, these costs must either be borne by families (which may negatively affect inclusion), or by a sponsoring organisation (which would have to fundraise for them). Our teachers and school leaders are critical to our ability to deliver quality without sacrificing sustainability. Rather than relying on expensive, centralised teams for programme delivery, we focus on equipping school leaders with the knowledge, skills, and resources necessary to lead learning autonomously, and hold them to account for results. External research shows that this school management approach is driving learning progress. This aligns with PEAS’ belief that local ownership is the key to the long-term sustainability. Identify a renewable income source to support operations. Grant financing is a short-term and often problematic source of funding. It forces organisations to plan around 1-5 year grant cycles, and requires substantial resources to win and manage. Renewable sources of income, such as government subsidies or school-generated revenues, can reduce the degree to which schools are reliant on philanthropic support. PEAS focuses on supporting schools to operate sustainably by providing financial management training to school leaders, and forging public-private partnerships with Ministries of Education to publicly finance school places.